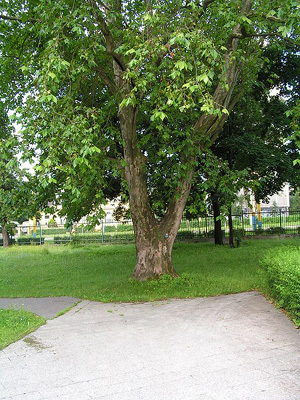 Pyramidal in youth, developing with age a large, open, wide spreading canopy with massive branches. Foliage is medium to dark green in summer turning yellow brown in autumn. Leaves are alternate, simple, truncate, to cordate, 6" to 7" long, 8" to 10" wide, 3 to 5 lobed, with triangular-ovate, toothed lobes. Bark is olive green to creamy, exfoliating. Prefers deep, rich, moist, well drained soils, but will grow in about anything; withstands high pH and pollutants. 'Bloodgood' has a greater resistance to anthracnose than the species.